You never want your barrel to get too hot. Accuracy suffers when barrels over-heat, and excessive heat is not good for barrel life. So how do you monitor your barrel’s temperature? You can check if the barrel is “warm to the touch” — but that method is not particularly precise. There is a better way — using temperature-sensitive strips. McMaster.com (a large industrial supply house) offers stick-on temp strips with values from 86° F to 140° F. A pack of ten (10) of these strips (item 59535K13) costs $10.71. So figure it’ll cost you about a buck per barrel for strips. That’s cheap insurance for your precious barrels. Neconos.com offers Bar-L Benchrest strips that visually display heat readings from 86 to 140 degrees. Think of these strips as compact, unbreakable thermometers. With adhesive backing, they can also be used to monitor barrel heating. Put a strip on the side of the barrel and the barrel’s temp will be indicated by a stripe that changes from black to green. 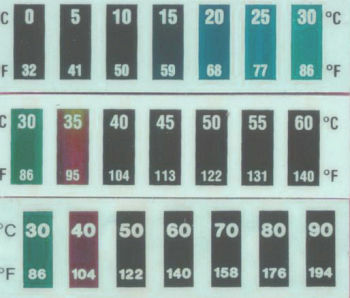 There is also a “general purpose” strip that reads to 196 degrees (bottom row). The Benchrest strip (86F to 140F) is in the middle. Bar-L temp strips cost $9.00, or $25.00 for a 3-pack. 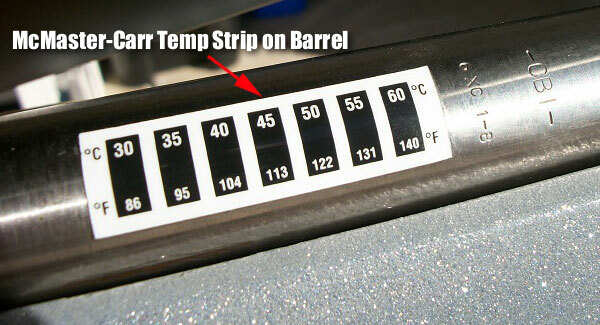 Share the post "Beat the Heat with Barrel Temp Strips"
So how hot is too hot? Do we have a benchmark? The ultimate ‘too hot’ would be the autoignition (cook-off) temperature of the propellant. This is around +170C (+338F) for single-base propellants. Other problems encountered would be droop, differential cooling of the barrel and general thermal expansion problems. The first meaning the hot barrel is less stiff, and hence the barrel droops due to gravity. The longer and hotter the barrel, the more droop you get. The second is the result of greater cooling on one side of the barrel that the other. This causes a temperature difference on either side of the barrel. the result is the barrel (muzzle) moving towards the cooled side. The effect can be reduced by thermally lagging the barrel (keeping it all at a similar temperature). The third are general expansion effects which cause the barrel to move as heated due to slight material differences, fixings, etc. Editor: Neil — Thanks for telling about these other effects that can occur when barrels get too hot! As a varmint hunter I have always wondered the same thing. This year I will try the strips for the first time, but would really like to understand what max temp is before damage starts to occur, as a guideline. I have never had any rounds cook off, but others in my group have. I always keep two rifles at hand for cooling reasons. Thank goodness this fine product now exists since I am too incompetent to use the sense of feel/tempature the good Lord saw fit to put into my hands. I miss Nomad47’s posts, I pray his wife is getting better..